Engine has had good maintenance with work having been done on injectors, newer heat exchanger and oil cooler. Good and complete maintenance records aboard. Shaft seal is packing gland style. Carvel mahogany 1-3/8" planks on sawn frames spaced every 16". The stringers are 3" by 8-1/2" fir with bronze fasteners. Bilges are dry and painted. Teak decks appear to be in very good condition. This boat has benefited from being kept in a boathouse since 1996. 2016 hull and bottom painted, 2015 house and brightwork painted and varnish done. Teak decks appear in very good condition as does the whole boat. Mast hinges for lowering under cover as does the bimini top. Flybridge upholstery and helm has canvas cover also. Enter the saloon frpm the cockpit via aft door port of center to an "L" shaped settee and table to starboard. This converts to a double berth when needed. Ahead of that to starboard is the helm and navigation electronics. To port upon entering there is a long settee with the back converting to two single berths. All the upholstery and foam inside has been replaced in recent years. It appears as contemporary and in good condition. The parquet floors have been refinished as well. The galley is to port equipped with a single basin sink, 3 burner Magic Chef propane stove/oven, Norcold refrigerator/freezer and sufficient counter tops. Down forward is the head to starboard and the double berth forward. There is also a decent sized hanging locker. Headliners have been replaced through much of the boat with insulated materials. The saloon has a Samsung 24 inch TV with Blue Ray CD Player which hinges down from the headliner between the helm and the "L" shaped settee. Some windows were replaced recently. All windows on the sides and back have wood blinds. Forward has a canvas cover. Yeti Ice chest on cockpit deck. Cabin heat is supplied by a Red Dot Style engine heat and a propane, free standing Coleman heater. 2 bilge pumps, one is new and 1 new shower sump pump. TWO BOAT OWNER! HE SAYS GET HER SOLD! This is a very nice, upgraded example of one of Grand Banks' most popular designs. 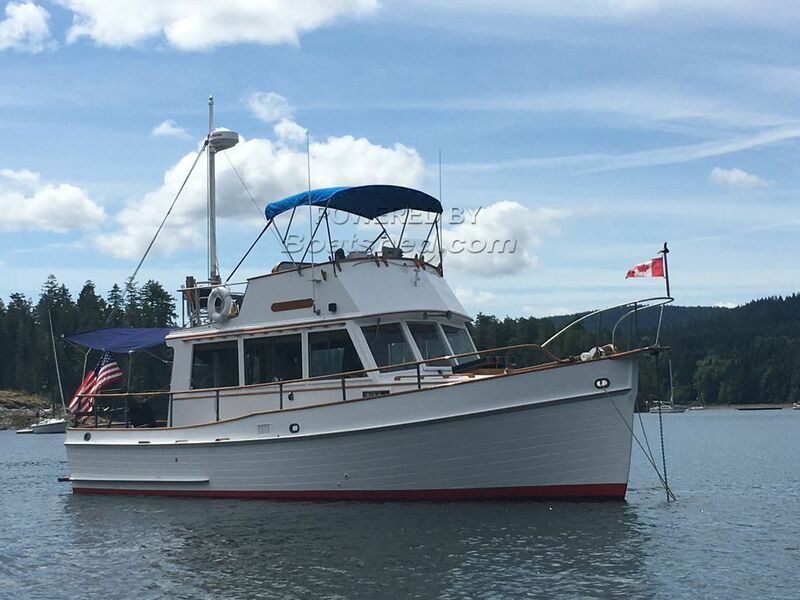 For those seeking one of the absolute definitive small trawlers, a classic Grand Banks 32, this boat is a must see. She has been completely repainted recently, and the brightwork refinished. In additional to its physical condition you will find this boat very well equipped with current upgrades. Be sure to view my video, current photos and 360s to confirm my written word! She is boathouse-kept in a transferrable slip in Seattle. I learned years ago that it can be a real value opportunity to find a boat that has had recent work and new equipment installed because the seller often spends much more in upgrades and restoration costs than will ever be recouped in the sale. This Grand Banks 32 Flybridge Sedan has been personally photographed and viewed by Gary Buck of Boatshed Seattle. Click here for contact details.